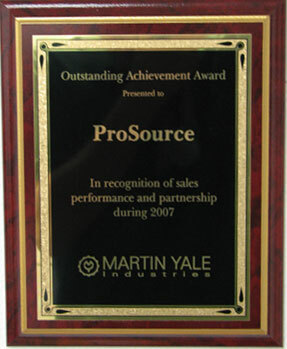 ProSource Packaging, Inc., receives the Martin Yale Outstanding Achievement Award 2007 in recognition of sales performance and partnership during 2007. Clara Arias Baumgarten, CEO of ProSource Packaging, Inc. accepts this award presented by David Roman of Martin Yale Industries. View the Martin Yale Outstanding Achievement Award 2007 Video.